It seems that everybody who has a personal affection to Mr. Szeto Wah (司徒华), regardless of their ages, refers him as "Uncle Wah". And in the community of oversea Chinese dissidents, that is indeed everybody. Szeto Wah spent most of his adult life in Hong Kong, working first in primary schools and then a local representative. By late 1980s, he had risen to the high ranks of the Hong Kong legislature and was appointed by the mainland government to the important committee drafting the Hong Kong Basic Law, the constitution for the former colony. It was then his career and life took a drastic turn. In 1989, as students in Beijing demonstrated on streets, Szeto Wah also broke his ties with the government there. He withdrew from the Basic Law drafting committee and founded the Hong Kong Alliance in Support of Patriotic Democratic Movements in China. Ever since May of that year, he has served as the Chairman of this Alliance till the day he died. Immediately after the massacre, he took the leadership role in organizing a daring "Operation Yellow Bird" to rescue hundreds of student leaders and dissidents who were on the run on mainland and bring them to Hong Kong in secret before sending them off to the safety of western countries. For more than 20 years since, Szeto Wah and his Alliance steadfastly upheld their demand to evaluate the 1989 movement, worked diligently to help the dissidents who escaped from China, and actively participated in the democratic processes in Hong Kong itself. Most remarkably, they have organized the annual Commemoration of Tiananmen Massacre at Victoria Park, consistently drawing a crowd more than 100,000. It is the biggest and arguably the only large-scale mass commemoration event for the subject matter in the whole world. 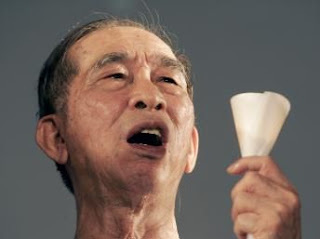 Szeto Wah, or Uncle Wah, died of lung cancer on January 2, 2011. He was 79.